On December the 1st 1923, Gleno's dam broke down causing 356 victims. This is one of the worst disasters happened in Italy. Gleno's dam and Gleno mountain are placed on the Orobie Alps, in the Vilminore di Scalve municipality (near Bergamo). 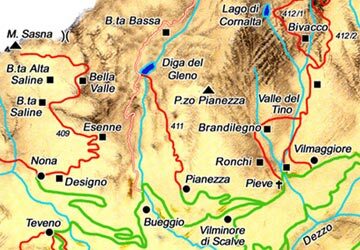 The dam has been planned and financed by private entrepreneurs, the Viganò family. The construction started in 1916 and ended at the beginning of 1923. The initial project, providing for a system on gravity, has been left in the middle of working, to adopt a multi-arches system, in order to create an artificial lake which exploited river Povo's waters. The aim of the dam construction, in fact, was to fill up electric centrals in the valley. On Saturday, December 1st, 1923, 40 days after the inauguration, some of the arches broke down: a lot of water fell on the valley's villages until reaching Iseo's Lake. First Bueggio, a small village of the Vilminore municipality, then Dezzo; in the end, the water flew into Dezzo torrent, destroying Corna di Darfo. The collapse was already been indicated, because of the lack of professionalism, the speed and the carelessness during the construction: the news said about a not well-washing of sand, scaffoldings forgotten in the cement and leaks of water. Moreover, that sad day the rolling shutters hadn't been opened: water got over the limits. After the collapse, the dam hasn't been reconstructed anymore. Today, it's possible to visit the shocking ruins of the dam, surrounded by the wonderful background of the Mountain Gleno (2882 metres), walking on the CAI 411 path, from Pianezza village (1265 m) to Gleno's Dam (1520 m). It's an easy walk of about an hour .